Idiopathic Toe Walking in kids..Is it flexor dominance? You see this at times in the office. Kiddos (or adults) who walk on their toes for no apparent reason. many have shortened heel cords with limited ankle dorsiflexion (1,2). Some studies report an incidence of 7-24% in pediatric populations (3) with an average of about 5% in children that are 5.5 years old (4). It seems to occur in about 2% of normally developing kids aged 5.5 years and 40% of those that have some sort of neuropsychiatric diagnosis or missed a developmental window (5-7), with an increased incidence familialy (8). The question here is why, not what. Physical treatment modalities (2) seem to help, we think most likely to plastic changes in the connective tissue. Orthotics may prove useful due to similar mechanisms, especially if there is an equinus deformity or forefoot to rearfoot abnormaility (9). More agressive (and invasive) measures like Botox, seem to not. An interesting study using whole body vibration (10) produced some immediate but short lived positive results. This really gets you thinking about joint and muscle mechanoreceptors and the cerebellum, and makes us think that perhaps we also should be looking (and treating) north of the foot. We could not find any studies looking at the effects of proprioceptive or vestibular exercises effects on this, but think it could be promising area of therapy and we will continue to employ them until our clinical results tell us otherwise. 2. Harris NM. 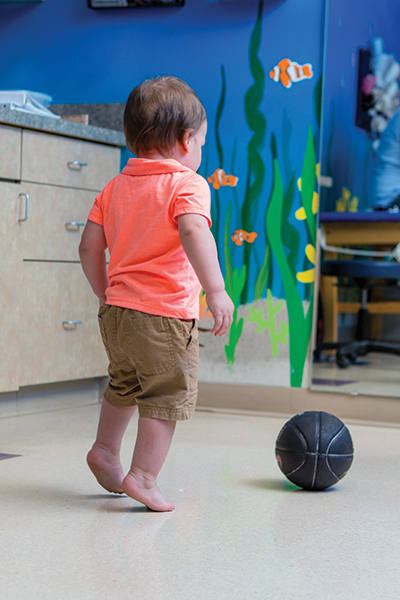 Multidisciplinary approach led to positive results for pediatric patient with idiopathic toe walking. Presented at the Association of Children’s Prosthetic-Orthotic Clinics Annual Meeting, Broomfield, CO, April 15, 2016. 3. Engelbert R, Gorter JW, Uiterwaal C, et al. Idiopathic toe-walking in children, adolescents and young adults: a matter of local or generalised stiffness? BMC Musculoskelet Disord. 2011;12:61. 4. Engström P, Tedroff K. The prevalence and course of idiopathic toe-walking in 5-year-old children. Pediatrics 2012;130(2):279-284. 9. Herrin K, Geil M. A comparison of orthoses in the treatment of idiopathic toe walking: a randomized controlled trial. Prosthet Orthot Int 2016;40(2):262-269. 10. Williams CM, Michalitsis J, Murphy AT, et al. Whole-body vibration results in short-term improvement in the gait of children with idiopathic toe walking. J Child Neurol 2016;31(9):1143-1149.